A television series filmed entirely in Brisbane created an international sensation when it premiered on Monday, 3 March on Network Ten. Screen Queensland chief executive officer Tracey Vieira said the six-part home-grown crime thriller was filmed and produced in Brisbane by local Emmy® and BAFTA Award winning production house, Hoodlum. “Secrets & Lies is an Australian first in FTA television as Hoodlum allows the audience to put their own sleuthing skills to work by accessing bonus material that unfolds across a suite of digital platforms,” she said. “In making the multiplatform an integral part of the storytelling, this is a great testament to the innovative skill-set of the Brisbane writers and producers of the series,” said Ms Vieira. Arts Minister Ian Walker said Secrets & Lies would be one of the year’s television highlights. “This home-grown crime thriller, produced with Queensland Government support through Screen Queensland, is another great example of the recent buzz of film production activity happening in our State,” Minister Walker said. “Queensland has truly been in the international spotlight of late with the filming of major film and television productions such as Secrets & Lies, Unbroken, Modern Family and the soon to be filmed San Andreas. “These productions provide an economic boost, create jobs, generate tourism and increase the skills and experience of local crews and talent,” he said. Screen Queensland provided a total of $637,615 in Production and Development Funding to Secrets & Lies – an investment that returned $4,759,420 in Queensland Production Expenditure (QPE) to the State. Hoodlum CEO Tracey Robertson and CCO Nathan Mayfield said the support they received from Screen Queensland was crucial in getting the project off the ground. “Screen Queensland’s support has been instrumental to creating Secrets & Lies. While our productions are receiving great momentum overseas, we’re committed to the development of further projects in Queensland with Brisbane as our production base,” Ms Robertson said. Secrets & Lies has been written by Brisbane based, author turned scriptwriter, Stephen Irwin. 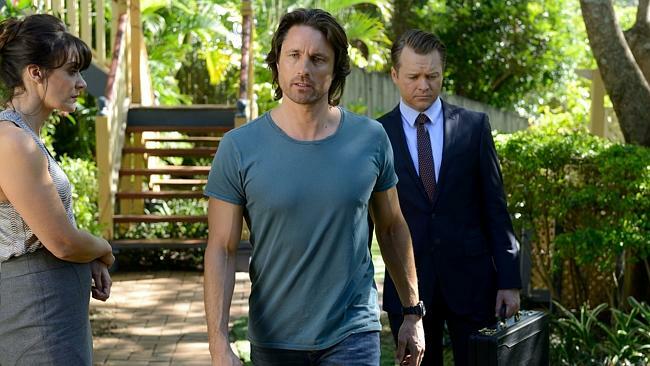 It stars Martin Henderson (The Ring, Little Fish), as lead Ben Gundelach along with Diana Glenn (The Slap, Killing Time) as Christy Gundelach, Anthony Hayes (Devil’s Dust, Bikie Wars: Brothers in Arms) as Detective Cornielle and Adrienne Pickering (The Reef, Rake) as Jess Murnane. Secrets & Lies centres on a family man (Henderson) who becomes the prime suspect of a murder. He has no choice but to try to find the real killer as his marriage, his kids, his reputation, and his sanity are all at stake. Screen Queensland’s role is to develop and support the local screen industry, attract production to Queensland, and celebrate an active screen culture across the State. Screen Queensland supports and promotes a creative, innovative and commercially sustainable screen industry in Queensland that makes productions designed to entertain and connect with worldwide audiences.